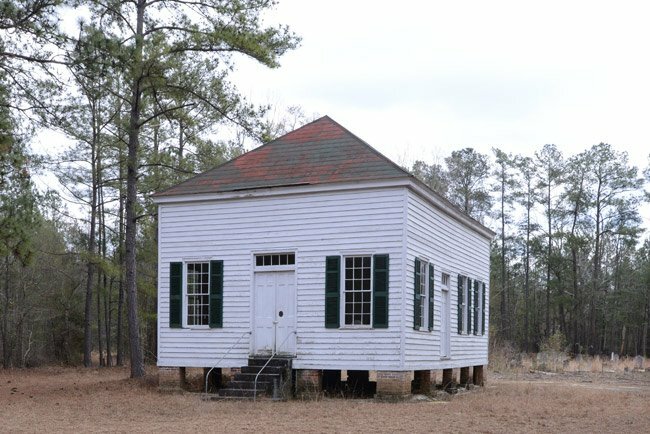 Antioch Christian church in Allendale was formed in 1833, and this “meeting house”-style structure was built circa 1835. 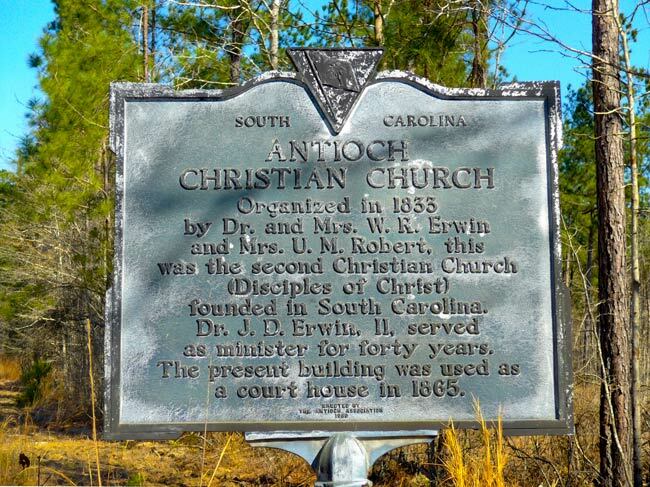 Antioch Christian Church was the second Disciples of Christ church formed in South Carolina and remains the state’s oldest church structure of that denomination. The church was founded by Dr. William R. Erwin and after he, his wife, and her sister-in-law were excommunicated from Kirkland Church (now Smyrna Baptist Church) on charges of heterodoxy, or disagreeing with church orthodoxy. The group met in Dr. Erwin’s home for worship prior to the construction of this church. 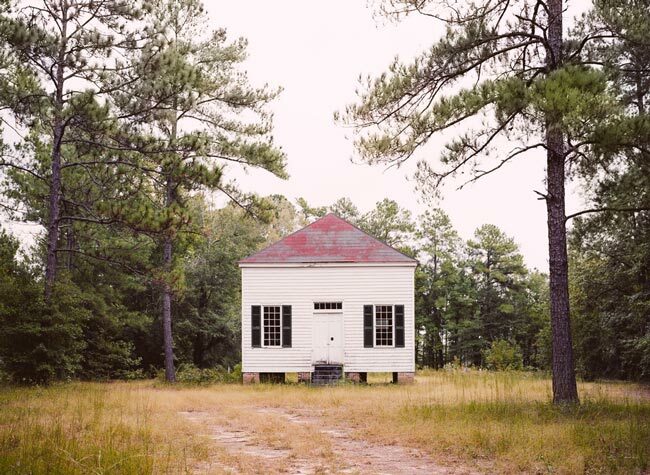 The interior of the church remains as simple as the exterior with plastered walls and original hand-hewn pine pews. There are windows and/or doors on each wall offering ample natural light, and ventilation. The ceiling is exposed with natural wood beams. Antioch Christian Church, built ca. 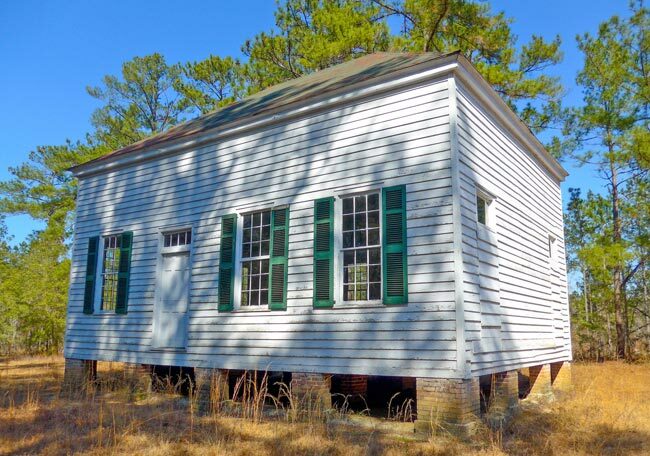 1835, was the second Disciples of Christ Church in South Carolina. 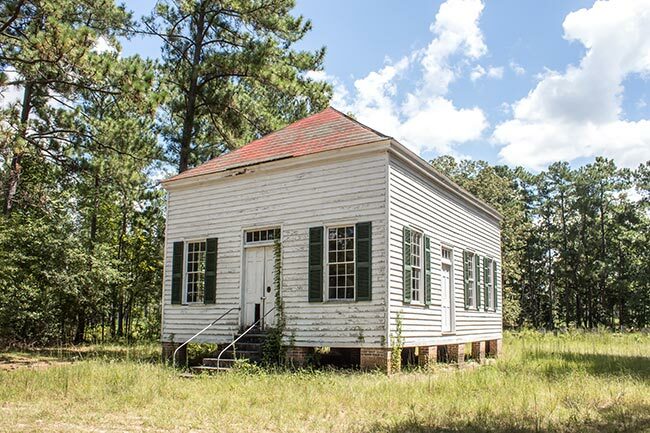 Today, according to the South Carolina Disciples, it is the oldest standing structure of that faith in the state and has been referred to as the “Mother Church.” Antioch is also significant as an excellent example of the meeting house style of church architecture. 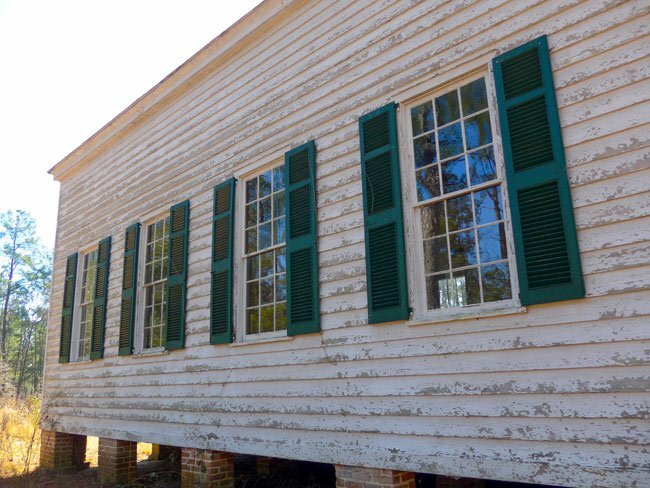 The clapboard structure rests upon low brick pier foundations and has a hipped roof covered by pressed tin. The front (west) façade features double six-paneled doors with a five-paned transom, flanked by a window on each side. The right side façade has a single six-paneled door with a four-paned transom. This door is flanked by one window to the left and two on the right. The rear (east) façade reveals the only major alteration to the structure – two doors were cut from two original windows in the 1930s to provide passage to Sunday School rooms. These rooms have since been torn down and the doorways covered with siding. The simplicity of the design is carried out in the interior. 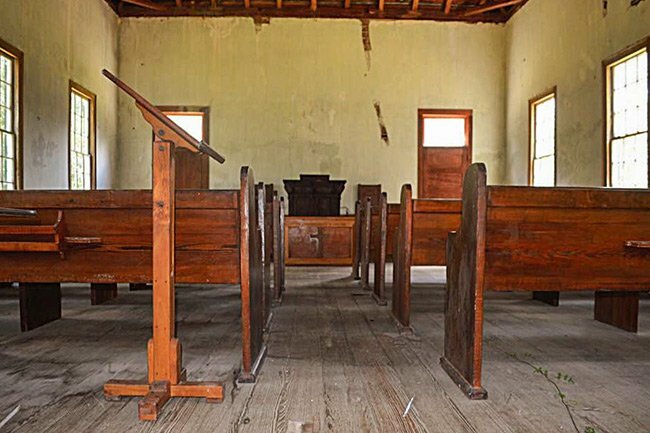 The walls are plaster, and the original pews of hand-hewn pine remain intact. The South Carolina Disciples of Christ renovated the church in 1976, although the interior was not included in the renovation. 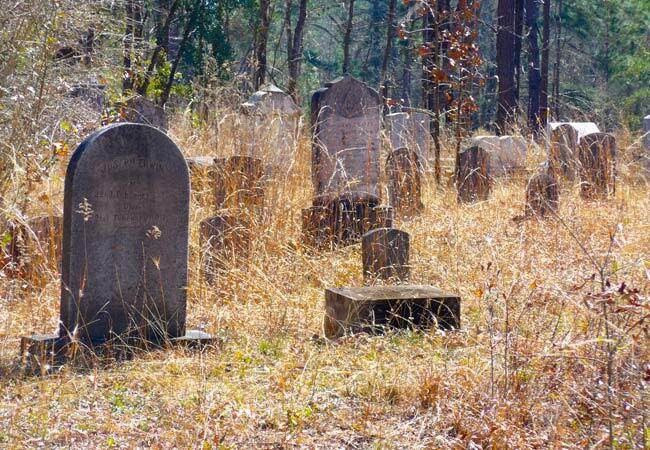 Included within the acreage is a cemetery where many of Allendale’s oldest families are buried. Many thanks to of Taylors for sharing this shot. 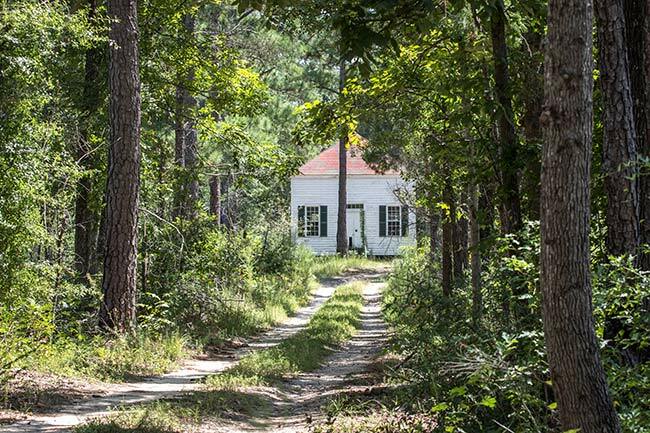 Bill enjoys the singular distinction of being the only person ever to have visited all 1,400 of South Carolina’s National Historic Landmarks. He has published several helpful e-books which serve as invaluable travel guides to the Palmetto State. What fantastic memories, George, thank you so very much for sharing these with us! We really enjoyed reading them. We would love to make this comment a “reflection” higher up on the page, we feel that everyone who comes across this page could greatly benefit from reading your memories, thank you again! I was born Sept 24, 1940 at Gravel Hill Plantation, about 5 miles from Antioch Church. My first pony was received from Santa Clause in 1945, right after my father came home from WWII. I never owned a saddle for Rex, because my mother felt saddles were dangerous. Cousins coming to visit us at Gravel Hill and I would do horseback rides all over the country dirt roads and Antioch was a favorite destination. We were always amazed that the doors were never locked and we would explore the building, but never did we do any harm to the property. The Erving Plantation home was about a mile from the church, and there was a tale about Dr. Erving having a skeleton hanhing in a closet in that old house. During those years no one lived in the house, and we searched, but never found the skeleton. Those were my fondest growing up years, which I dearly miss. I left Gravel Hill after High School, and lived there briefly after graduation from College. None of the “Gravel Hill” property remains in our family today. I live in Orangeburg, SC. Gen. James Daniel Erwin and Sarah Ann Elizabeth Roberts were my great grandparents. They are buried here as well as many aunts, cousins and uncles. I attended a church service here followed by a covered picmic. Lovely spot. I remember attending one or more worship services with my family at the Antioch church. My father and grandfather were likely members there. More recently, I attended a picnic on a Sunday near Easter, an annual event.